Swiss governmental and non-governmental organizations were intensely involved in humanitarian activities for the victims of World War I. From 1916 on, the country opened its borders to a select number of sick or injured prisoners of war from Germany, France, Belgium and Britain for healing and recovery. Based on agreements with the belligerent nations – who paid the costs – the prisoners were interned for several months in sanatoria and hotels mainly in Alpine tourist locations, thus supporting an industry lying idle. The internment of foreign POWs also legitimized and stressed the usefulness of the Swiss neutrality policy both internally and externally. The allegory of Switzerland as an island in the surge of war was quite a popular subject at the time. The artist combined this well-known picture with the idea of the country’s humanitarian mission. Humanitarian aid, based on traditions reaching back to the 19th century, was promoted as a correlate to Switzerland’s neutrality policy. It constituted an important pillar of Swiss national identity during the Great War. As the light rays illustrate, the humanitarian aid for prisoners of war (POWs) was an important field of action. From the very outbreak of the Great War, non-governmental actors situated in Switzerland, such as the International Committee of the Red Cross (ICRC) – as well as the Swiss government itself – were involved in various humanitarian activities on behalf of POWs. This article aims to outline Switzerland’s relief for foreign POWs, focusing especially on the system of internment of sick prisoners of war. It is based on a relatively small and still growing basis of studies on a topic that was of great importance to Switzerland’s self-perception during the Great War. The First World War in various ways set new quantitative standards for what was understood about armed conflicts, including captivity. In Europe, approximately 7 to 9 million soldiers became prisoners during the war – a number far beyond contemporary imagination. Whereas before, war captivity was of a rather short duration, it now became a long-term phenomenon that lasted for years. Captivity severely strained prisoners, both physically and mentally. Over the years, POWs were discovered to be useful and soon became “indispensable manpower” for the growing demands of the war economy. Initially, though, captivity was subject to the immense logistical problems it caused to all warring parties. Military administrations were overextended. Accordingly, the crowded camps were badly equipped, the sanitary situation was precarious and the prisoners undernourished and weak. Infectious diseases such as tuberculosis, typhus and diphtheria ravaged the camps. Hundreds of thousands of POWs got sick. Their miserable fate quickly became the subject of propaganda by belligerent powers. Public interest grew and humanitarian aid programs spread. According to the Geneva Convention, severely injured POWs were to be mutually exchanged by the warring parties. On the initiative of the ICRC, the Federal Council (Swiss government) and the Vatican encouraged the French and German governments to enter negotiations to observe these international regulations. From March 1915 onwards, dozens of hospital trains, departing simultaneously from Lyon and Constance, crossed Swiss territory to repatriate thousands of invalid soldiers who had lost one or more limbs in battle, whose skulls, spines and faces had been severely injured, or who were partly or fully paralysed or blind. While this exchange of the Western Front’s grands blessés (the severely injured) was carried out through Switzerland and the Netherlands, tens of thousands of severely wounded POWs from the Eastern Front were exchanged via Denmark and Sweden. Was it not our country with its magnificent mountains, its silent valleys, with its pure and aromatic alpine air and its curative waters that was able to cure the wounded, ease the exhausted, strengthen the shattered, offer recovery and new courage to face life? During the Great War, several neutrals faced the internment of foreign civilians and military personnel. At the very outbreak of war, the Dutch, for example, saw themselves confronted with 1 million civilian refugees from Belgium and tens of thousands of members of the Belgian Armed Forces crossing their borders. Later, based on an Anglo-German agreement dating from July 1917, around 10,000 British and German POWs each were interned in the Netherlands. Sweden, Denmark and Norway developed similar projects. Switzerland had some experience with the temporary internment of foreign soldiers during the Franco-Prussian War in 1871: after the French Eastern Army, named after its commander General Charles-Denis Bourbaki (1816–1897), had crossed the border, a large number of military units were interned for around six weeks. As early as 1915, the ICRC, the Holy See and the Swiss Federal Council launched initiatives to intern and hospitalise lightly wounded and sick POWs on Swiss soil. The intention to provide a large-scale and long-term internment of foreign POWs for medical treatment based on mutual agreements between the warring parties was a completely new concept, both diplomatically and logistically. The unique system, developed in Switzerland and later crowned by the Berne Agreements of spring 1918, set new international legal standards for the exchange and repatriation of POWs. Following difficult Franco-German negotiations, first conditions were agreed to at the beginning of 1916. Sick and wounded prisoners were selected for hospitalisation in Switzerland not only by camp physicians but also by commissions of Swiss medical officers visiting those camps. Their selection was based on medical criteria agreed upon beforehand and was reviewed by Swiss control commissions in Constance and Lyon before the prisoners could be transported to Switzerland. The categories favoured prisoners who suffered from the widespread tuberculosis – especially pulmonary tuberculosis – or other respiratory diseases which at the time were thought to be best cured by fresh air therapies, for which Switzerland’s alpine climate was considered ideal. Other categories included: prisoners with chronic cardiovascular diseases; those with illnesses of sense, digestive or sexual organs; those with severe dysfunctions of the nervous system; those who were blind or had lost an eye; those who were deaf; those who had lost one or more limb; those suffering from rheumatism, arthrosis, other diseases caused by injuries; or those with illnesses that rendered them incapable of military service indefinitely. In January 1916, the first contingent of French and German POWs suffering from tuberculosis arrived in Switzerland – 100 prisoners from each country. The French were sent to Aigle in the Romandie; the Germans to the Grison resort of Davos. Thousands were to follow them in the subsequent months. After the successful launch of the project, the Belgian and British governments joined the system under the same conditions that had been negotiated with Paris and Berlin. From the beginning of the project until the signature of the armistices in 1918, more than 67,000 POWs kept by the Allied and Central Powers were interned in Switzerland. Of these prisoners, just under 38,000 were French; more than 21,000 German; 4,000 Belgian; 4,000 British; and 600 from Austria-Hungary. Apart from a short period in the summer of 1918, there were never more than 30,000 POWs simultaneously interned in the country. Split off in relatively small groups, the foreign POWs were interned in a wide variety of hotels and sanatoria distributed among some 200 mainly alpine towns and villages with an already strongly developed tourist and spa infrastructure. The warring nations had mutually agreed to hand over internees who had escaped to their home countries back to their captors. For this reason, the localities did not need to be guarded and the foreign guests were taken care of by hotel and medical personnel only. Selected internees, subordinated to Swiss officers in charge of several facilities, were themselves responsible for their comrades’ correct behaviour. Specially designated internment regions were created by joining towns and villages which hosted internees into one administrative unit. The top of the command structure was in the hands of Colonel Carl Hauser (1866–1956), head of the Swiss Army’s medical services. The internees were placed in internment regions according to their nationality. More or less, the regions mirrored the tourist preferences of the pre-war period. A register from August 1916 shows that French and Belgians were quartered in the regions of Montreux and Lake Geneva, in Aigle, Leysin and surroundings, Montana and Lower Valais, Gruyère, in the western Jura Mountains, Upper Valais, in the Aargau spa town of Schinznach and in wide parts of the Bernese Oberland, whereas the British were placed in Château-d’Œx, Mürren and partially also in Leysin. German internees were allocated accommodations in Davos, Arosa and the surrounding areas, in the regions of Glarus-Weesen, St. Gallen, Appenzell, Ragaz-Päfers, Chur as well as in the Grison Oberland. In central Switzerland around Lake Lucerne both Germans and French were interned; delinquents were locked up in the prison of Witzwil in the Bernese Seeland. The administrative division changed slightly over time, though generally remained stable. In the summer of 1916, a military hospital (Armeesanitätsanstalt, or ASA) was founded in Lucerne, where POWs of all nations were treated. In autumn 1917, the ASA was dissolved and replaced by a hospital for German internees, also in Lucerne, and by a new ASA for allied internees in Fribourg. Here, Swiss surgeons operated on wounded prisoners who had initially been treated in captivity but whose injuries required further medical attention. They suffered mainly from skull and brain injuries, extremities injuries, badly healed fractures and pseudoarthrosis, as well as from trauma of the peripheral nervous system and corollaries. These complex orthopaedic and neurological surgeries were considered a very important field of practice for a Swiss war surgery otherwise untested for decades due to a lack of military conflicts. In addition to the physical recovery of the POWs, authorities focused on their “moral regeneration”. This latter aspect was important for the Swiss authorities, who were concerned that the internees return to their home country as valuable members of their society – which would have to be rebuilt once the war had ended. Discipline, labour and education were considered appropriate means to achieve these aims. For every internee capable of work, an occupation adapted to his respective strengths and abilities was compulsory. The authorities, as well as several relief organizations, such as the Swiss Red Cross, maintained special workshops and establishments where internees produced goods like furniture, orthopaedic shoes and artificial limbs for the ASA. Hundreds of internees got the opportunity to study at regular Swiss universities or technical colleges; moreover, several of the internment facilities maintained their own libraries and schools, where language courses or education in craft or trade were provided. The internees published their own newspapers and could engage in cultural activities. POWs fully able to work could also be employed in local companies or in agriculture. Such employment of internees as skilled or unskilled workers was from the very beginning viewed with scepticism by Swiss trade unions. In fact, several enterprises could profit from this welcome resource in an otherwise dried-out labour market, and employers – at least partially – explicitly favoured internees, who worked under bargain conditions. As, in the course of the tightening conditions of economic warfare, the supply situation of the Swiss population grew worse and worse, the extra mouths to be fed were questioned increasingly. “Whereas, during the arrival of Indians, Senegalese negroes, brown and yellow Asians, the crowd is racing to distribute gifts,” stated a newspaper article on the advent of Swiss militaries suffering from the flu in Berne in July 1918, “our soldiers were left with nothing.” Although authorities stressed that the internees were in no way privileged in terms of nutrition, clearly this was precisely what some suspected. As a consequence of the harshening attitude toward the “foreign war guests”, the possibilities for families of the interned to visit their fathers, husbands and sons were restricted more and more. In his final report, Major Favre mentioned other conflict zones the internment caused from the very beginning: “Every day evidence arrives at the office of the army’s head doctor that the internment service is not being understood at all”, he wrote. “Abroad, they talk of bribes adroitly distributed by families to achieve the internment of one of theirs. Here, many say that the internment is merely an issue of hoteliers.” Corruption during the selection procedure did seem to cause serious problems to the authorities. In fact, records indicate that repeated threats of serious punishment were made to those who tried to manipulate the selection committees, or were involved in placement services. On the other hand, the hotel industry was undeniably one of the main beneficiaries of the internment. In the decades before the war, during the booming belle epoche of Swiss alpine tourism, infrastructure such as hotels, sanatoria, and spas as well as trails, mountain and rack railways, had been expanded in the most spectacular way. The fact that, during the summer crisis of 1914, the vacation guests departed and had yet to return was a blow to the Swiss tourism industry from which it did not recover for a long time. The placement of internees as paying guests from 1916 onwards saved the included hotels from the certain bankruptcy they had been facing. Accordingly, it was the hospitality lobby from the various tourist regions that most resolutely opposed the authorities’ primary ideas to construct barracks for the internees. During the course of the internment, regional interest groups repeatedly urged the federal government to allocate more POWs to certain establishments. The often vigorous attitude with which hoteliers defended their business interests hardly corresponded with the propaganda image of generous and selfless hospitality. Despite this criticism, the internment of sick and wounded alien POWs as a whole was hardly ever questioned by the public, the media or by political parties. The internees themselves were well aware of the privilege they enjoyed by being allowed to rest, cure their ills and regain new strength in Switzerland. Dozens of thank you-letters show the depth of the gratitude of interned POWs, their relatives and government representatives. Not all foreign military personnel came to the country as invited patients and spa guests. Hundreds of Russian POWs, for example, fled camps and labour commandos in Germany or Austria-Hungary and crossed the border into Switzerland between 1915 and 1920. Despite continuing negotiations, the Tsarist government never achieved the regular internment of Russian prisoners of the Central Powers in Switzerland. They were the largest in number, however, and their situation was one of the most deplorable because they were hardly supported by their government. The Russians were treated harshly and outnumbered prisoners of all other powers in their rate of mortality by illness – mainly tuberculosis – and general weakness. Whereas in the first years, escaped Russian POWs were kindly received in Switzerland and mostly journeyed on to France, the revolutionary turnovers in the Tsarist Empire after 1917 caused, on the one hand, an expanding number and a prolonged stay of Russian military fugitives, and, on the other hand, a growing mistrust among the Swiss authorities and a wide swath of the public towards their real or imagined Bolshevik sympathies. When, in the first months of 1918, more than 1,000 deserters of a mutinous Russian expeditionary corps to France entered the country, authorities became seriously worried. All Russian soldiers – regardless of how they arrived in Switzerland – were now treated like deserters, put under military custody and subject to forced labour in rural engineering, agriculture and the construction of hydroelectric power stations. In addition to the members of the former Russian expeditionary corps, foreign deserters and war resisters who found refuge in Switzerland were quite large in number. Up until May 1919, around 26,000 were still registered in Switzerland, of which 12,000 were Italian, 7,000 German, 2,000 from France and Austria-Hungary respectively, as well as smaller numbers of Turks, Serbs, Romanians, Belgians and Bulgarians. Nearly all of them were regarded with great distrust and disapproval for their “unpatriotic behaviour” by the liberal and conservative press as well as the authorities. Except for Alsatians who had deserted, for whose conduct the Swiss partisans of France showed understanding and even compassion, war resisters were denounced for general disloyalty, cowardice and war profiteering. Whereas in the early years, they could almost freely settle down and find a job to make a living, the growing social opposition in Switzerland – that would find its dramatic peak in the General Strike of November 1918 – led to the tightening of measures in regards to their entry and residence. The internment of foreign POWs in Switzerland from 1916 to 1919 was not merely the selfless act of a “Good Samaritan”, but an important pillar of Swiss politics during the Great War. 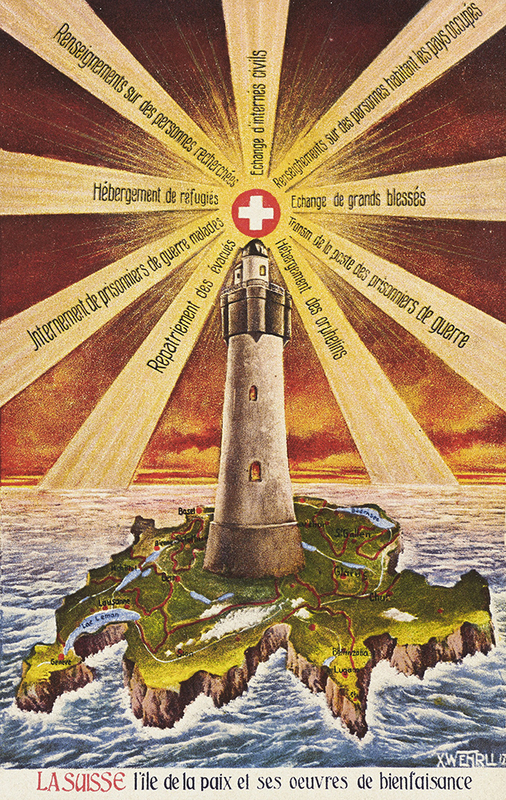 As the postcard mentioned at the beginning of this article shows, the internment was meant to be one of the humanitarian rays the peaceful “Swiss lighthouse” sent out to lighten the bellicose darkness around it. Internment was an act of external propaganda in order to promote the advantages of a neutral Switzerland in the middle of a warring continent to all parties. With reference to the internment, Switzerland was also able to regain some freedom of action in its trade policy, which had been under growing pressure due to the economic warfare of its neighbours. Pointing to the foreign POWs harboured within the country’s borders, the Federal Council was able to obtain an increase of the import quota several times for fertilizers, potatoes and charcoal. In September 1917, for example, Germany agreed to deliver, on behalf of the internees, 74,000 extra tons of charcoal that the Swiss authorities could however use at their sole discretion. This corresponded to more than 3 percent of the total Swiss coal imports in 1917 and was an amount that – in times of extreme shortage – was not to be underestimated. On the other hand, internment functioned internally, too. While Swiss society during the war was divided along the language borders – French-speaking Switzerland generally was in favour of the Entente; whereas most people in the German-speaking part of the country supported the Central Powers – the internment of members of both warring parties was an opportunity to reconnect the quarrelling social factions in a common humanitarian cause – at least according to the picture drawn by the propaganda. Regardless, at a time when many – in contemplation of the horrors going on outside the country – suffered from forced inactivity, humanitarian aid for the POWs offered a possibility for numerous volunteers to focus on something “useful” they could do for the victims of war. The internment reassured society that neutrality did not simply mean non-interference in the course of the world, but could also serve to do something “good”. At the same time, the internment generated tangible gains for quite a range of actors: an underdeveloped military surgery was able to adapt to the effects of modern warfare and several companies profited from the welcome labour forces. The total costs of internment added up to some 137 million Swiss francs, which was lower than the gross value of the tourist sector in pre-war 1913 alone, but still nearly equalled the export of the flourishing Swiss machine industry in 1918. With all the bills being paid by the countries of origin, the placement of internees meant big business, too, for an important branch of the national economy. The fact that non-internee foreigners – for example, fugitives and war resisters – were not at all welcome guests shows the extent to which humanitarian engagement in Switzerland was narrowly tied to political and economic interests. Its opportunistic function notwithstanding, Switzerland’s calculated humanity nevertheless provided basic relief to tens of thousands of captured soldiers who were among the most distressed victims of the Great War. In addition, the agreements on internment in Switzerland set a legal basis for the later codification of the treatment of POWs in armed conflicts, thus, for example, inspiring the 1929 Geneva Convention relative to the Treatment of Prisoners of War. The internment of sick and wounded POWs during the First World War marks a specific chapter in a long and ambivalent history of Switzerland’s humanitarian role in international politics. ↑ Wehrli, X.: Friedensinsel Schweiz, Swiss National Museum, LM-73693.42 [translation by author], see online: http://www.14-18.ch/files/gimgs/7_a2.jpg (retrieved 13 October 2015). ↑ Kreis, Georg: Insel der unsicheren Geborgenheit. Die Schweiz in den Kriegsjahren 1914–1918, Zürich 2013, pp. 282ff; Kreis, Georg: Schweizer Postkarten aus dem Ersten Weltkrieg, Baden 2013, p. 98. ↑ Oltmer, Jochen: Einführung. Funktionen und Erfahrungen von Kriegsgefangenschaft im Europa des Ersten Weltkriegs, in: Oltmer, Jochen (ed): Kriegsgefangene im Europa des Ersten Weltkriegs, Paderborn 2006, p. 11. ↑ Oltmer, Jochen: Unentbehrliche Arbeitskräfte. Kriegsgefangene in Deutschland 1914–1918, in: Oltmer, Kriegsgefangene 2006, pp. 67–96. ↑ Trechsel, Max: Die Liebestätigkeit der Schweiz, in: Ruchti, Jacob (ed. ): Geschichte der Schweiz 1914–1919. Politisch, wirtschaftlich und kulturell, volume 2, Bern 1930, p. 393. ↑ Hinz, Uta: Humanität im Krieg? Internationales Rotes Kreuz und Kriegsgefangenenhilfe im Ersten Weltkrieg, in: Oltmer, Kriegsgefangene 2006, p. 226. ↑ “War nicht unser Land mit seinen herrlichen Bergen, seinen stillen Tälern, mit seiner reinen würzigen Alpenluft und seinen heilkräftigen Wassern wie geschaffen, um diesen Verwundeten Heilung, diesen Erschöpften Ruhe, diesen Zerrütteten Stärkung, neuen Lebensmut, Wiederherstellung zu schenken?” Nagel, Ernst: Die Liebestätigkeit der Schweiz während des Weltkrieges, volume 2, Basel 1916, p. 75 [translation by author]. ↑ Abbenhuis, Martje B.: The Art of Staying Neutral. The Netherlands in the First World War, 1914–1918, Amsterdam 2006, pp. 109ff; Hinz, Humanität 2006, p. 226. ↑ Conseil fédéral, Procès-verbal de la séance du 15 janvier 1916: Nr. 113. Übernahme von Pflegebedürftigen Verwundeten aus Deutschland und Frankreich, Documents Diplomatiques Suisses, volume 6, document 167; Documents Diplomatiques Suisses, volume 6, document 167; dodis.ch/43442. ↑ Favre, Edouard: L’internement en Suisse des prisonniers de guerre malades ou blessés 1916–1919, 3 volumes, Bern 1917–1919, pp. 272–297. ↑ Draenert, Marcelin Oliver: Kriegschirurgie und Kriegsorthopädie in der Schweiz zur Zeit des Ersten Weltkrieges, Dissertation, University of Heidelberg 2011, pp. 112–123. ↑ Ibid., pp. 193–281, 292f. ↑ Gysin, Roland: “Sanitätsfestung Schweiz.” Über das Erheben der Stimme der Menschlichkeit. Internierte fremde Militärpersonen 1916–1919, unpublished master thesis, University of Zürich 1993, pp. 110ff. ↑ “Darum etwas mehr von der herben Unnahbarkeit unserer Berge, die in stiller Reinheit ihr Haupt zum Himmel erheben und doch so fest im Heimatboden wurzeln!” Schweizer Illustrierte Zeitung Nr. 24 of 10 June 1916, p. 370 [translation by author]. ↑ Favre, L’internement 1917–1919, p. 78 [translation by author]. For other accounts of indiscipline, mainly caused by the abuse of alcohol, see Draenert, Kriegschirurgie 2011, pp. 130ff. ↑ Walliser Bote of 20 July 1918, p. 2 [translated by author], quoted in Arnold, Franco: “Unsere Kriegsgäste” oder “Verräter ihres Landes”? Die Wahrnehmung der ausländischen Bevölkerung durch die Einheimischen im Oberwallis während des Ersten Weltkriegs, master thesis, University of Freiburg i. Üe. 2011, p. 85. ↑ Gysin, “Sanitätsfestung” 1993, p. 107. ↑ Favre, L’internement, Premier rapport, pp. vf [translated by author]. ↑ Gysin, “Sanitätsfestung” 1993, p. 72; Draenert, Kriegschirurgie 2011, p. 137. ↑ Gysin, “Sanitätsfestung” 1993, p. 59. ↑ Ibid., pp. 83–92. For petitions demanding the allocation of internees, see Swiss Federal Archives, Bern, CH-BAR#E27#1000/721#13960* (06.H.3.h.2.b.1). ↑ A compilation can be found in CH-BAR#E27#1000/721#13973* (06.H.3.h.2.b.2.A). ↑ Bürgisser, Thomas: “Unerwünschte Gäste”. Russische Soldaten in der Schweiz 1915-1920, Zürich 2010, p. 149. ↑ Sergeev, Evgenij Jur’evic: Kriegsgefangenschaft aus russischer Sicht. Russische Kriegsgefangene in Deutschland und im Habsburger Reich (1914–1918), in: Forum für osteuropäische Ideen- und Zeitgeschichte 1/2 (1997), pp. 127f. ↑ Hinz, Uta: Gefangen im Grossen Krieg. Kriegsgefangenschaft in Deutschland 1914–1921, Essen 2006, pp. 220–227, 235–246. ↑ Bürgisser, “Gäste” 2010, pp. 95ff. ↑ XIII. Bericht des Bundesrates an die Bundesversammlung über die von ihm auf Grund der Bundesbeschlüsse vom 3. August 1914 und 3. April 1919 getroffenen Massnahmen (vom 15. November 1919), in: Schweizerisches Bundesblatt No 47, V (26. November 1919), p. 449. ↑ See for example Kury, Patrick: Über Fremde reden. Überfremdungsdiskurs und Ausgrenzung in der Schweiz 1900–1945, Zürich 2002, p. 128. For the affair of the rejected Elsassian deserter Léon Lallemand, see Arlettaz, Gérard et Silvia: La Suisse une terre d’accueil en question, pp. 145f; Durrer, Bettina: Auf der Flucht vor dem Kriegsdienst. Deserteure und Refraktäre in der Schweiz während des Ersten Weltkrieges, in: Goehrke, Carsten/Zimmermann, Werner G. (eds. ): “Zuflucht Schweiz”. Der Umgang mit Asylproblemen im 19. und 20. Jahrhundert, Zürich 1994, p. 200. ↑ Durrer, Flucht 1994; Arlettaz, Gérard et Silvia: Les chambres fédérales face à la présence et à l’immigration étrangères (1914–1922), in: Etudes et sources 16/17 (1990/1991), pp. 40ff. ↑ Gysin, “Sanitätsfestung” 1993, pp. 108f. ↑ However, such benefits could not stop the drastic decline of importations. For the figures of coal import during the war cf. Ruchti, Jacob: Geschichte der Schweiz 1914–1919. Politisch, wirtschaftlich und kulturell, volume 2, Bern 1930, p. 244. ↑ Püntener, Peter: Schätzung der Bruttowertschöpfung in der Schweiz 1850–1913. Banken, öffentlicher Verkehr, Post, Telephon, Telegraph, Tourismus, unpublished master thesis, University of Zürich 1990, p. 76; Eidgenössisches statistisches Bureau (ed. ): Statistisches Jahrbuch der Schweiz 1920, Bern 1921, p. 230. ↑ Draenert, Kriegschirurgie 2011, p. 291 stresses in contrast that the payments were only allowed to reach the break-even point. No study exists that goes into detail on the actual financial gains of internment. ↑ Wylie, Neville: The 1929 Prisoners of War Convention and the Building of the Inter-War Prisoner of War Regime, in: Scheipers, Sibylle (ed. ): Prisoners in War, Oxford 2010, pp. 91-108, here 94. ↑ I am most grateful for the help provided by Daniel Marc Segesser and Nick Niles with editing this article in correct English. Arlettaz, Gérald; Arlettaz, Silvia: Les Chambres fédérales face à la présence et à l'immigration étrangères (1914-1922), in: Studien und Quellen. Veröffentlichungen des Schweizerischen Bundesarchivs = Etudes et sources. Publications des Archives fédérales suisses = Studi e fonti. Pubblicazioni dell'Archivio federale svizzero 16-17, 1991, pp. 9-155. Arlettaz, Gérald: La Suisse une terre d'accueil en question. L'importance de la première Guerre mondiale: L'émigration politique en Europe aux XIXe et XXe siècles. Actes du colloque de Rome (3-5 mars 1988), Rome 1991: Ecole française de Rome, pp. 139-159. Arnold, Franco: 'Unsere Kriegsgäste' oder 'Verräter ihres Landes'? Die Wahrnehmung der ausländischen Bevölkerung durch die Einheimischen im Oberwallis während des Ersten Weltkriegs (thesis), Freiburg 2011: Université de Fribourg/Universität Freiburg. Bürgisser, Thomas: Menschlichkeit aus Staatsräson. Die Internierung ausländischer Kriegsgefangener in der Schweiz im Ersten Weltkrieg, in: Rossfeld, Roman / Buomberger, Thomas / Kury, Patrick (eds. ): 14/18. Die Schweiz und der Grosse Krieg, Baden 2014: hier + jetzt, pp. 264-287. Draenert, Marcelin Oliver: Kriegschirurgie und Kriegsorthopädie in der Schweiz zur Zeit des Ersten Weltkrieges (thesis), Heidelberg 2011: Universität Heidelberg. Favre, Édouard: L'internement en Suisse des prisonniers de guerre malades ou blessés, 3 volumes, Geneva 1917-1919: Georg. Gysin, Roland: 'Sanitätsfestung Schweiz'. Über das Erheben der Stimme der Menschlichkeit. Internierte fremde Militärpersonen 1916–1919 (thesis), Zurich 1993: Universität Zürich. Gysin, Roland: Die Internierung fremder Militärpersonen im 1. Weltkrieg. Vom Nutzen der Humanität und den Mühen in der Asylpolitik, in: Guex, Sebastien / Studer, Brigitte / Degen, Bernhard et al. (eds. ): Die Schweiz 1798-1998. Staat - Gesellschaft - Politik. Krisen und Stabilisierung, volume 2, Zurich 1998: Chronos, pp. 33-46. Kreis, Georg: Schweizer Postkarten aus dem ersten Weltkrieg, Baden 2013: hier + jetzt. Morell, Irina: Britisch-schweizerische Wahrnehmungen im Ersten Weltkrieg (thesis), Zurich 2014: Universität Zürich. Nagel, Ernst: Die Liebestätigkeit der Schweiz im Weltkriege, 2 volumes, Basel 1916: Frobenius. Nationale Kommission für die Veröffentlichung Diplomatischer Dokumente der Schweiz (ed. ): Documents diplomatiques Suisses = Diplomatische Dokumente der Schweiz, volume 6, Zurich; Locarno; Geneva 1981: Chronos; Dadò; Éd. Zoé. Nationale Kommission für die Veröffentlichung Diplomatischer Dokumente der Schweiz (ed. ): Documents diplomatiques Suisses = Diplomatische Dokumente der Schweiz, volume 7, Zurich; Locarno; Geneva 1981: Chronos; Dadò; Éd. Zoé. Trechsel, Max: Die Liebestätigkeit der Schweiz, in: Ruchti, Jacob (ed. ): Geschichte der Schweiz während des Weltkrieges 1914-1919. Politisch, wirtschaftlich und kulturell, volume 2, Bern 1930: Paul Haupt, pp. 375-463. Bürgisser, Thomas: Internees (Switzerland) , in: 1914-1918-online. International Encyclopedia of the First World War, ed. by Ute Daniel, Peter Gatrell, Oliver Janz, Heather Jones, Jennifer Keene, Alan Kramer, and Bill Nasson, issued by Freie Universität Berlin, Berlin 2015-09-29. DOI: 10.15463/ie1418.10735.